Tips to pass the 2015 IECC and Stretch Code: HERS <55 is easy! This is a follow up to a post providing an overview of the 2015 IECC code. Read it here. Concerned about passing the Stretch Code or ERI (HERS) base code alternative path? Here are some tips and tricks to get you there. In Stretch Code communities, to achieve a building permit, a Preliminary HERS Certificate must be submitted to the building official demonstrating that the designed specifications pass code. As your HERS rater, we build the home in a 3D modeling software, then enter all the data points to into the energy model - including R-values of all components of the thermal boundary. Defaults are entered for items not yet selected or calculated , such as appliances and whole house and duct airtightness. A preliminary HERS certificate is generated with the 'index', or numeric score, which must meet code before a permit is issued. The preliminary energy model is 'trued up' with data points gathered from the two site visits - the Midpoint Insulation Inspection and the Final Inspection. The Final HERS rating with an 'index' demonstrating code compliance is presented the building official to acquire a Certificate of Occupancy. If the HERS rating is only being used to achieve Mass Save New Construction rebates, the final results and energy model are uploaded to the utility program administrator. If the house is designed as a 'high performance' home, you should be in good shape. Of course this can have a variety of meanings, but generally it means the designer and builder understand that a priority of the owner is to have an optimally efficient home. To achieve this target, home systems, layout, and construction details are determined through a 'system thinking' lense: everything must work together to ensure the home is high performance. Yes, this often omits spec houses and those projects with modest budgets. For 'standard' homes, design is increasingly important with the new energy code. Don't use plans from a warmer climate; design the home using the prescriptive R-value table from the base code (download here). Keep building forms simple- dormers and tray ceilings are more difficult to airseal and may require more expensive spray foam insulation. The building design should incorporate mechanical systems: Create spaces for duct work to be within the insulated thermal enclosure. If using heat pumps, ductless or ducted, room layouts should ensure occupants are comfortable. Well designed eave overhangs will improve a HERS rating by reducing heat gain in the summer months. Appropriate design details will give more flexibility to other aspects of the project, including equipment, appliance, and even window and door selection. At HIS & HERS Energy Efficiency we include a significant amount of consulting in our HERS rating service. This starts with a one hour sit down meeting to review your plans, discuss airsealing and other details, and it continues until the completion of your project. As needed, we can provide recommendations to improve your chances of hitting blower door targets and other key aspects of the HERS rating energy model. A good HERS rater goes well beyond code compliance verification: they are an important part of the project team to aid in your success and the betterment of the building. Bring the HERS rater on early to make the most of their expertise. Atlas ThermalStar Intergrade rigid board is the most cost effective way to insulate an unfinished basement. 3. Insulate foundation walls, consider insulating the slab. Insulating the basement walls instead of the basement ceiling will greatly improve the blower door 'ACH' (air change per hour, must be =/< 3 ACH50) result and may enable you to avoid a duct blaster test of the forced air duct work. Even if the basement is not intentionally conditioned, the basement wall insulation will improve the HERS rating result. Insulating the slab and slab edge has a smaller impact on the HERS result, yet it will reduce condensation on the slab and will make the basement 'finish ready'. Keep ducts out of attics, uninsulated basements, and exterior walls. If ducts are in uninsulated areas, they must be tested to tighter than 4 CFM of Total leakage per 100 sq feet of conditioned floor area. If the testing must be done, make sure your duct installer is responsible for passing this threshold - add it to the contract! Moreover, even if ducts are not going to be tested, they must be sealed per the energy code. An increasingly popular option is to complete the duct test at the midpoint insulation inspection while ducts are still accessible. If it passes, then another test is not needed. If it fails, access for repair is simpler. Refrigerators are typically rated between 500 and 800 kWh . Picking a more efficient model will drop the HERS index. The refrigerator , washing machine, dryer, dishwasher, and ceiling fans can move a HERS score a few points. Builders that leave these choices to the owners, should ensure that systems with mediocre energy efficiency ratings don't increase (worsen) the final HERS index. Avoid the budget ceiling fans from box stores - these use more energy than units costing a little more. In the past appliances could be an afterthought - a huge fridge with icemaker and automatic cupcake froster consuming 800 kWh, didn't' matter. To meet the HERS 55, appliance ratings can be confirmed with the HERS rater before they are purchased. It is wise for builders to include in their contracts energy consumption thresholds for client-chosen appliances. 6. Assign responsibility for airsealing details, have a strategy. The best home designs have airbarrier details defined on plans. Yet more often than not, it is up to the builder to determine the continuous aibarrier that is aligned with the insulation barrier. The builder will likely delegate specific air sealing duties to sub contractors, yet it is up to him/her to do quality control of these efforts. Is the wall sheathing sealed to the frame? Are bottom plates gaseketed? Is the attic flat sealed before insulation is blown? Do all sub contractors understand that any holes drilled through the thermal enclosure must be properly sealed? "I thought the insulators were going to do that," is a phrase we can't hear anymore. 7. Use only high efficiency heat, cooling, and hot water systems. Most modern HVAC equipment is already high efficiency : 95%+ AFUE for natural gas and propane equipment. 10+ HSPF/ 20+ SEER for heat pumps is easy to spec. Although there may be some exceptions, consider oil fired boilers and standard resistance electric hot water tanks gone the way of the dodo bird - do not use them. The inefficiency of these systems significantly impacts the HERS rating and can not be risked. Fireplace inserts and wood stoves should be avoided, or if necessary, select systems to be made airtight with dedicated combustion air from outside, which is code requirement and much better for indoor air-quality. There are several ways to pass the ventilation requirement. Your HERS rater will guide you through this and often can assist in dialing in the appropriate venatilation rate at the final inspection . The 2015 IECC MA Amendments [PDF] provides several options for meeting the ventilation requirement. A properly chosen ventilation system will have a better impact on the HERS rating. Balanced ventilation systems, HRV and ERVs, are optimal for indoor air-quality. Yet they usually consume more energy than a high efficiency bath fan, so will often increase the HERS result. Exhaust-only ventilation, most commonly bath fans, provide reliable decent ventilation. Bath fans vary greatly in efficiency, quality, and airtightness, so ensure a good model is selected. Your HERS rater will help you dial in the proper ventilation rate at the final inspection. These are simple and practical steps to take to ensure your HERS rating will be below the 55 threshold. Be in touch with any questions. 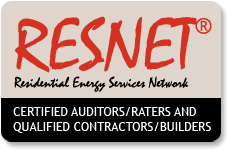 HIS & HERS is your Western MA source for energy code compliance and Massachusetts rebate program support. Happy building!